How will French museums deal with their colonial past? Occasionally- but lately more frequently- as if to repudiate the complaint that European culture is haughty and unmoored, European intellectuals demand change in the European cultural point of view. Even if you’re bored by this preoccupation, those who work with art and cultural heritage must read the recent report by Felwine Sarr and Bénédicte Savoy to the French Government, titled “The Restitution of African Cultural Heritage: Toward a New Relational Ethics.” It proposes a new way of thinking about the restitution of objects forcefully taken by colonial powers, and it may change the way we think about the relationship between the universal museums of Europe and the places from which artifacts originate. The report is born of President Macron’s statement in Burkina Faso in 2017 of his desire “to see the conditions put in place so as to allow for the temporary or definitive restitution of African cultural heritage to Africa.” Sarr and Savoy imagine a new paradigm in which former colonial countries view the act of restitution of objects as a form of future cultural survival of both the former colonizer and formerly colonized. To the authors, the crux of the problem is “the system of appropriation and alienation—the colonial system—for which certain European Museums, unwillingly have become the public archives.” They view the act of restitution of cultural property not as the mere return of an object but as an overt act to “open the possibility for the ‘universal,’ with whom they are so often associated in Europe, to gain a wider relevance beyond the continent.” Sarr and Savoy don’t define the “universal” but the report, in places, voices a cognitive universalism comprised of universal values reflected in common thought and language, as opposed to the cultural relativism that often guides the post-colonial relationship. While the report begins by making very big claims for itself- and largely succeeds- in a fit of self-restraint it limits the discussion of restitution to objects forcefully taken from sub-Saharan Africa, specifically from the four Francophone African colonies of Benin, Senegal, Mali, and Cameroon. I was troubled by the report’s lack of confidence in its own reasoning; if the act of restitution really offers such a profound benefit to both Europe and Africa, then why shouldn’t everything taken by force be returned? Sarr and Savoy make the important and undeniable observation that the forceful taking of property effects “both the individual and the group as part of the foundation of their humanity (their spirituality, creativity, transmission of knowledge)”- like all violence does- with the natural corollary that “the [forceful] acquisitions of cultural heritage should be considered within a different category: that of transgressive acts, which no juridical, administrative, cultural, or economic apparatus would be capable of legitimizing.” Sure, taking money and politics off the table for an issue presented as so profoundly important is tolerable within the context of the proposal, but why then limit yourself to a few countries in sub-Saharan Africa? What about Egypt and Algeria? Why not throw in Asia and the Americas? It’s a flaw from which the report might never survive in the hands of French lawyers and politicians. I enjoyed Sarr and Savoy’s brief survey of the history of the law in this area. They point out that until the end of the 19th century, “the right to pillage and plunder what had belonged to the enemy” and “the right to appropriate for oneself what one had taken from the enemy”, were the codified and legal practices of war. While these practices became illegal within Europe in the late 19th century, they continued in Asia and Africa well into the 20th century. The report catalogues military raids and punitive expeditions conducted by England, Belgium, Germany, Holland, and France, during the 19th century in China (1860), Korea (1866), Ethiopia (1868), the Asante Kingdom (1874), Cameroon (1884), the Tanganyika lake region and the future Belgian Congo (1884), the current region of Mali (1890), Dahomey (1892), the Kingdom of Benin (1897), present-day Guinea (1898), Indonesia (1906), and Tanzania (1907), that became occasions for extraordinary pillaging of cultural heritage. Thereafter, they turn to a brief discussion of the “Convention with Respect to the Laws and Customs of War on Land and its annex: Regulations concerning the Laws and Customs of War on Land”- known today in the art business as the First Hague Convention- signed in 1899 at the Hague by 24 sovereign nations, making the practice of pillaging cultural artifacts during military campaigns illegal. They divert from their legal analysis, which at times feels obligatory, to an examination of what the world has foregone by limiting the discussion about restitution “to only the juridical aspects and to questions of legitimate ownership.” They want us to consider the implications of choosing a method of restitution not just as a “political and symbolic act, but also as an expression of a philosophical and relational order among people and countries.” One of the more charming ideas expressed in this part of the discussion is how certain artifacts should be viewed as not mere objects but as active subjects. The artifacts, “having become diasporas, are the mediators of a relation that needs to be reinvented. Their return to their communities of origin does not have as its aim to substitute one form of physical and semantic imprisonment by another, that would this time be justified by the idea of the ‘rightful property owner’.” That’s powerful stuff. Yes, it hints of shamanism, but if you are willing to ponder their proposal, why shouldn’t we be open to the artists’ original intentions when they created the works and see where it takes us? It’s no different than listening to a great piece of music or reading a great piece of literature and finding inspiration to address difficult problems. Isn’t that why we look at artwork in the first place? acquired after 1960 under proven conditions of illicit trade. objects housed in certain museums which were initially loaned out to them by African institutions for exhibits or campaigns of restoration, but which were never returned. that the pieces acquired conformed to the necessary rigor and careful monitoring of the apparatus in place on the art market after the application of the UNESCO Convention of 1970, in other words, without “taking any ethical risks.” Gifts from foreign Heads of State to the French government remain the property of France except where the heads of state concerned have been ruled against for the misuse of public funds (that doesn’t leave much). The proposed timing of the exercise exudes haste as well as thrift: the immediate formal submission of the inventory of pieces coming from African states concerned (according to their present borders) which are currently held in public French collections for objects originating from Benin, Senegal, Nigeria, Ethiopia, Mali, and Cameroon. The second phase- Spring 2019 to November 2022- would involve a process of inventorying, the sharing of digital files, and an intensive transcontinental dialogue. Restitution, the third phase, would begin in November 2022 and would be open-ended. Since the removal of cultural objects took place over a long period of time, the report argues that the process of restitution should not be limited in time. Currently, the French cultural heritage code deems objects in public collections inalienable. The report suggests establishing definitive restitution as the “key-element of heightened cultural cooperation, made concrete through the signature of a bilateral agreement, which will legitimize the new procedure of restitution introduced into the code concerning cultural heritage.” Changes to the law would also decide procedure for exceptions to restitution agreements, but- as a parting shot- the report notes that changes to the French cultural heritage code should not be “limited to objects only housed in museums,” a point that has not been lost on the French art market. Michael Kinsley’s aphorism— “If you’re scared to go too far, you won’t go far enough”— describes the fate of an average political or cultural thinker, but Sarr and Savoy have a highly evolved point of view, and the report, while it could have gone farther, goes quite far enough. In the very least, it should be considered seriously. A certain amount of information about the meeting of the Advisory Council on Wildlife Trafficking on March 20th has been passed on to me by members of the art trade who were in attendance. It’s clear that the Council has no authority to make policy and is merely advising the Obama administration on policy options. However, it’s equally clear that the Council represents the will of a small group of wildlife organizations. Federal advisory bodies are usually dominated by interest groups that are able to place their members on the committee, which for these groups means that the government receives good information on the “true preferences” of private interests. Only in Washington can the interests of a narrowly focused group be considered an accurate reflection of the nation’s needs. The fact is that the Council contains no member with knowledge of the arts and antiques market, and, as a result, cannot offer any real advice to the White House on dealing with the issue of antiques. An example of this is the Council’s recommendation to the administration that it should start a public campaign to decrease public demand for goods made from endangered species: the Council’s discussion of the “demand” for ivory could articulate no sophisticated distinction between bona fide antiques containing ivory and tourist trade materials. In consequence of this, the “ivory problem” will remain a ripe target for a total ban on the sale of objects containing the material. In a letter sent to Director Ashe of the U.S. Fish and Wildlife Service on March 7th, the Art and Antique Dealers League of America (“AADLA”) and the National Antique and Art Dealers Association of America (“NAADAA”) proposed the creation of an art advisory panel to assist the Fish and Wildlife Service in assessing whether objects being imported, exported or sold in interstate commerce are antiques. The implementation of an advisory panel would provide an effective solution to a problem viewed by the Council and the Administration as complex; it would encourage transparency, promote the lawful trade of ESA-permitted objects, and discourage the black market in unpermitted objects. These two dealer groups were represented at the meeting last week by Clinton Howell, the President of the AADLA and a member of NAADAA. Mr. Howell provided the Council with strong critique of the administration’s recent actions, especially of Director Ashe’s “Order No. 210” that places severe restriction on the ability of dealers and auctioneers to sell antiques containing endangered species. Mr. Howell also distributed an excellent survey of the use of ivory in antiques, entitled “Ivory and Its Widespread Use in Cultural Artifacts,” done by the British Antique Dealers’ Association. Mr. Howell other materials included a report on the use of ivory in jewelry and a fact-sheet on the illegal ivory trade. While the meeting contained a discussion about Senator Feinstein and Representative Garamendi of California developing legislation that could ban all ivory sales in the US, the immediate concern for the art and antiques trade remains the ominous restrictions in Order No. 210. Legislation could take months if not years to complete, but the Fish and Wildlife Service has already begun to impose new restrictions on the import and export of objects containing endangered species, and will likely begin enforcement of the new rules on the interstate trade within 60-90 days. These new regulations will destroy many small businesses long before a vote is taken in Congress. Very little in museum exhibitions of contemporary prints and photographs makes any deep impression on me these days. That is a confession of something lacking in myself, but it is not, as it may appear at first sight, a reason for ignoring the exhibition schedules entirely. MoMA’s special exhibition, “Henri Labrouste: Structure Brought to Light,” is a fascinating study of the evolution of architecture in the 19th Century from neoclassic idealism to modern rationalism, a transition accomplished through a re-interpretation of the ancient art forms, a reminder of why the study of Antiquity is still important today. Henri Labrouste was a French architect who, from 1824 to 1830, studied at the French Academy in Rome, where he developed his ideas on “romantic rationalism” in architecture. Before Labrouste, the Beaux-Arts school insisted that architectural design should conform to certain ideals of structural form agreed upon by the Academy. Labrouste believed that architecture should reflect the needs of society, and his work reflects this rationalism by incorporating the technical aspects of industrial society in its design. Labrouste’s reputation rests on his Bibliothèque Sainte-Geneviève, Paris (1838–50), a superbly clear design in which an elegant cast iron structure seems to have been slotted into the cage of masonry: it was one of the first monumental, rather than utilitarian, public buildings to have an exposed cast iron frame in the interior. The masonry exterior is a powerful Cinquecento essay employing a range of semicircular-headed windows to illuminate the great library space inside. His work on the Bibliothèque Sainte-Geneviève placed Labrouste in the highest echelons of French Government architects, and between 1854 and 1875 he created the iron and glass interior of the Reading Room at the Bibliothèque Nationale in Paris. In consequence of these achievements, Labrouste was one of those rare artists whose works became a benchmark for aesthetic design, both in France and around the world. And Labrouste’s libraries are, to me, two of the most beautiful spaces in all of Paris. Aristotle’s phrase formed itself within the gabbled verses and floated out into the studious silence of the library of Saint Genevieve where he had read, sheltered from the sin of Paris, night by night. By his elbow a delicate Siamese conned a handbook of strategy. Fed and feeding brains about me: under glowlamps, impaled, with faintly beating feelers: and in my mind’s darkness a sloth of the underworld, reluctant, shy of brightness, shifting her dragon scaly folds. Thought is the thought of thought. Tranquil brightness. The soul is in a manner all that is: the soul is the form of forms. Tranquility sudden, vast, candescent: form of forms. As a young adult I visited Paris with the intention of photographing French architecture, and I remember being mesmerized by the quiet strength and utter accessibility of the Bibliotèque Sainte-Geneviève. What I failed to realize at the time- but know now after seeing MoMA’s exhibition- is that Labrouste’s perspective on rationalism was not a revolutionary thought but an evolutionary one gained by re-interpreting the meaning of ancient Etruscan architecture. The Beaux-Arts School in France in the 19th Century was modeled on the study of classical antiquities, so there was a great emphasis on maintaining classical forms of structure. Labrouste, as a young student, decided to look at the classical forms with a fresh eye. In his Master’s thesis on the Greek temples at Paestum, Italy, Labrouste was the first to theorize that the architecture at the site had evolved from the classical Greek architectural styles introduced by Greek migrants. The Beaux-Arts school taught that the buildings at the site that didn’t meet the perfection of classical Greek style must have been earlier and poor attempts that missed the mark. To Labrouste, the structures at the site, all built within 100 years of each other, marked the localization of techniques imported from Greece; Labrouste argued that the building that closely resembled classical Greek proportions was build first and the other structures came later, as the buildings evolved from a process of adaptation to the new colonial environment at a time when the local inhabitants “having grown more powerful, wished to create a new architecture.” These thoughts on the evolution and adaptation of architecture informed later architects on the purpose of their craft and are still with us today. Henri Labrouste, Capital and base of a column of the portico at the Pantheon, Rome, 1925-1928, Pen, ink, graphite and wash on paper. MoMA does a superb job of underscoring Labrouste’s contribution to modern architecture, but equally impressive is the reflection on Labrouste’s study of ancient design and how the ancients helped Labrouste find modernity. We’re reminded how the study of ancient art can help form great minds. It’s easy and sometime convenient to associate the collecting and study of ancient art with the wealthy class, but in reality the middle class is the main beneficiary of our museum collections of ancient art. Wealthy American student can afford to visit Italy and Greece on extended stays, and ancient art is readily accessible to them in situ, much the same as it was for Labrouste. Middle class students in America access ancient art by visiting museums and working with academic collections, and only on occasion do they travel abroad. And let’s not make the mistake of thinking that ancient art can be studied through photographic images; the exhibition also tells us how important it is for students to view ancient art in person. 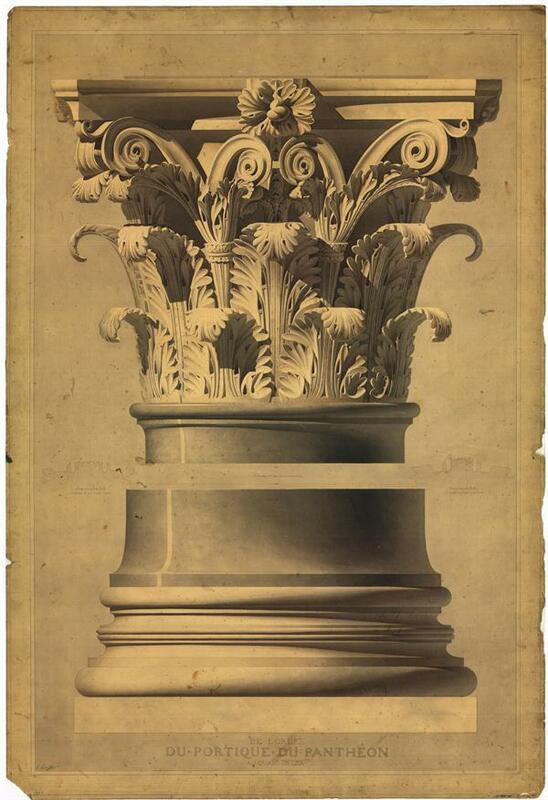 On display is Labrouste’s pen and ink drawing of a capital and base of a column from the Pantheon in Rome, an amazing study of structure and light that has an almost photographic quality to it; never could this work have been done without him spending countless hours viewing the site. Likewise, in his drawings of Paestum, the rendered shadows of feathers from arrows and the shadows of shields lashed to the marble columns are drawn so elegantly that it’s almost impossible to believe they were done by a human hand. Recently, American museums have been pressured to return ancient artifacts to their source countries due to theft and misappropriation. While these institutions must comply with the law, some thought should be given to safeguarding the collecting of ancient art, as to insure that future students have access to broad collections of ancient art without having to travel thousands of miles to see them. As history teaches, the future will always depend upon the reconsideration of the past. From the very beginning of the Republic, Americans have always delighted in accusing their chief magistrate of having totalitarian ambitions. With extraordinary derisiveness, every president since FDR has been called a “fascist” for alleged subversion of the Constitution, even in spite of Orwell’s observation in 1944 that misuse of the term had rendered it “almost entirely meaningless.” As a result, it’s become tradition for the wielder of power to be regarded with mistrust, a disagreeable but perhaps necessary state of affairs for both president and people. Thus, it’s not surprising to find two very different demonstrations of the royal prerogative being criticized in recent weeks: the use of drones to kill Americans and import restrictions on ancient coins. And if you are remotely interested in the proper functioning of our government, each example provides ample opportunity for evaluation and reflection. It is widely known that the “executive power” of the President enumerated in Article II of the Constitution was meant to create a strong executive. The Framers of the Constitution, who lived through a disastrous government under the Article of Confederation, viewed legislative government as too fragmented and episodic. It’s less known that the role of the Federal courts in explicating constitutional law is mentioned nowhere in the Constitution. Judicial review of executive and legislative actions was created out of whole cloth by the Supreme Court itself in the famous case of Marbury v. Madison. And since the power of the courts constitutional review is not structural to the Constitution but only a practical condition upon its successful operation, it need not be exercised whenever a court perceives an invasion of the Constitution. Courts always consider the threshold question of how importunately the occasion demands an answer. Sometimes it’s better to leave the issue to be worked out without an authoritative solution and other times the circumstances require a decision. Recently, the Department of Justice released a “White Paper” on the legality of killing American citizens who are believed to be “senior operational leaders” of al-Qaida or “an associated force.” Despite the obvious vagueness of terms that leaves one wondering how remote the “association” need be to avoid the breach, the central concern here is use of executive power without some form of judicial review. The United States after September 11th, our “Homeland America,” has new structures of constitutional democracy created by the Bush the Younger and Obama Administrations. In consequence of this, people have been denied rights that have long been regarded as fundamental, giving rise to indefinite, incommunicado detention, torture and abuse, and the denial of a fair chance to contest life-and-death charges. The “White Paper,” written by government lawyers, makes a pointed but unsubstantiated case for an unconstrained executive, necessary to deal with the security threats of today’s world. This new view sees terrorism and associated threats to Homeland America as qualitatively different from past security threats. As a result, a more flexible kind of “executive power” is required; one that cannot be readily accommodated within the traditional scheme of judicial and legislative oversight. As it turns out, the unique qualities of “executive power”- what Hamilton described in the Federalist Papers as the capacity to act with “decision, activity, secrecy and despatch” – are unique and essential advantages in this new world. And the nature of warfare against these new enemies relies more on intelligence gathering and covert action, so waiting for the courts or Congress to review or ratify executive action may compromise America’s ability to defend itself. 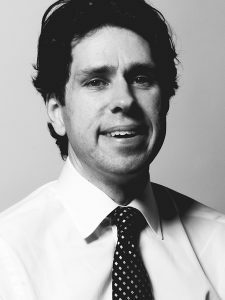 The problem with this new theory of executive power is that neither the nature of structural constitutional interpretation nor the security policy premises on which these claims are based support the case for the kind of expansive executive power found in the “White Paper.” Fundamentally, a theory of structural constitutionalism should not depend so heavily on something as transitory as the security threat du jour. It is also difficult to understand how these security threats are so very different from those faced before, and even if they are, one could easily conclude that unchecked “executive power” is not an effective means to meet them. For the purpose of contrast, the President’s imposition of import restrictions on ancient coins provides a more traditional look at “executive power.” Last week, the Ancient Coin Collectors Guild filed a Petition of Certiorari asking the Supreme Court to review the lower courts’ failure to conduct a “political question” analysis of the President’s actions before dismissing the Guild’s complaint. Three years ago, the Guild filed its lawsuit alleging that the government failed to comply with specific statutory requirements of the Convention on Cultural Property Implementation Act (“CPIA”). The CPIA imposes certain procedural and substantive constraints on the President’s authority to impose import restrictions on cultural objects. Over time, the President’s authority was delegated down to the Assistant Secretary of State, Bureau of Educational and Cultural Affairs of the State Department. Once the State Department authorized import restrictions on coins from Cyprus and China, U.S. Customs and Border Protection published regulations in the Federal Register imposing those import restrictions. The “particular question” posed by the Guild is quite narrow: whether the Government promulgated and applied import restrictions on coins in compliance with the CPIA. Courts have ample experience in determining whether a specific grant of power by the legislature is being followed by the President. This matter, argues the Guild, is thus well within the competence of a court to handle. Furthermore, the court of appeals’ dismissal of the Guild’s case because it touched on “foreign policy,” but without performing any further analysis of the particular legal issue actually before the court, places its decision making squarely at odds with that of the Supreme Court and other federal appeals courts, which have applied the “political question” analysis found in Baker v. Carr in a “foreign policy” context. Under these circumstances, the Guild asks the Supreme Court to grant certiorari to secure and maintain the applicability of its decisions by bringing the court of appeals and the two other circuits that have not addressed the issue into line with the decisions of the Court. While I doubt that Mr. Obama is giving this case much thought, it’s equally doubtful that Supreme Court will ever get another case presenting less benign “consequences of judicial action.” Although, I wouldn’t be taking any bets on the Guild’s chances of getting through the golden doors, as the Supreme Court accepts a mere 1-2% of the cases submitted on appeal. However, the odds get considerably better once the doors close behind the Guild; the Supreme Court has reversed or vacated this court of appeals in 61% of past cases. But no matter what happens in these two instances, the traditional view of “executive power” is not apt to be revived anytime soon. The portentous reluctance of the judiciary is not more use to us than the capriciousness of our legislators who are constantly trying to figure out what the next “serious” security threat will be when it is plain that the next “serious” security threat is their own stupidity.